That’s a giant-sized name in the realm of popular music. It would be impossible to contest Simon’s enormous contributions to music over the last six decades. 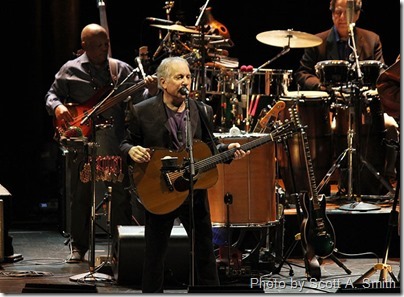 The multiple Grammy Award winner and Rock and Roll Hall of Fame inductee has a song catalog as vast as Bob Dylan’s work, and he proudly carries as much credit as Peter Gabriel for helping bring worldbeat music to the mainstream channels in rock and pop music. Now at age 74, Simon still can deliver in front of an audience. That’s exactly what happened when he performed a 2-hour concert for a capacity audience on May 6 at the Joint inside the Tulsa Hard Rock Hotel & Casino. Simon is a little grayer, sure, but he’s lost none of his passion for music. Hitting the stage at 8:15 p.m., Simon and his stellar backline of musicians played show-openers “The Boy in the Bubble” and “50 Ways to Leave Your Lover” with jazzy finesse without losing the edge of either composition. In a way, Simon and Co.’s versions sounded remarkably close to the original recordings but contained a bit of extra fire. Simon then swiveled his hips and pretended to shoot from his fingers as the audience cheered. The cherished Simon & Garfunkel classic “Homeward Bound” was stunning in its simplistic beauty, and “Slip Slidin’ Away” held an equal amount of magic and mystique on the Tulsa stage. Unlike some other veteran singers, Simon’s voice actually improved as each song progressed, and by the time he and his multi-instrumentalists reached “Still Crazy After All These Years,” Simon’s voice stood in rock-solid form, rivaling his vocal take on the original 1975 studio recording. For “Diamonds on the Soles of Her Shoes,” Simon and the band sped up the original version’s tempo a pinch, and the added level of urgency gave even more strength to an outstanding track. “You Can Call Me Al,” a good song but a good distance from Simon’s greatest accomplishments, kept the evening upbeat, while the encore “The Boxer” may have been the night’s brightest moment. Touching and delicate, this encore version of “The Boxer” hit home the fact that Simon’s work, like the still-talked-about, still-loved creations of Dylan, The Rolling Stones, The Beatles, The Who and other pop-culture titans, will, hopefully, live forever.